Included in this catalog are the most commonly called for fasteners. Many special types and sizes may also be available, so call us for your special needs. With each illustrated item, are the sizes and descriptions of the fasteners to facilitate ordering. We have tried to be as accurate as possible in Iisting dimensions, but we are not responsible for dimensional errors that might occur. The technical data and charts section of this catalog contains information gathered from reputable sources and manufacturers in the fastener industry.. If you have questions, please call us. Our sales staff can answer most questions and offer suggestions. Most industrial fasteners are covered by two basic standards: one for materials and properties; the other, for dimensions and tolerances. Specifications for materials and properties are published by the American Society for Testing and Materials (ASTM), although other groups such as the Society of Automotive Engineers (SAE) also publish specifications covering these requirements. Standards for dimensions and tolerances are issued by the American National Standards Institute (ANSI) in cooperation with the American Society of Mechanical Engineers (ASME) and the Industrial Fasteners Institute (IFI). Where applicable, published specifications covering a particular fastener will be referenced in the section of this booklet dealing with that fastener. When referring to standards and specifications, we will use only the well-known initials of the above societies-ANSI, ASME, IFI, ASTM and SAE. Standard fasteners are basic industrial fasteners - square and hex bolts, cap screws, carriage bolts, plow bolts, lag screws, studs, nuts, rivets and others - which have been standardized over the years as to type', style, usage, properties, dimensions and tolerances. These include a vast range of sizes and types stocked by distributors and manufacturers for an almost limitless range of applications: the assembly and maintenance of vehicles, appliances, farm equipment, construction equipment, industrial and plant machinery of all kinds, furniture and toys. Wherever there’s a need for holding parts together, holding them apart, holding them up, or holding them down, a standard fastener can usually be found to do the job efficiently and economically. Modern industrial fasteners are manufactured to a variety of standards covering dimensions, tolerances, materials, mechanical properties, testing procedures, etc. A Bolt is a device with a head on one end of a shank or body and a thread on the other end. Designed for insertion through holes in assembly parts, it is mated with a tapped nut. Tension is normally induced in the bolt to compress the assembly by rotating the nut. This may also be done by rotation of the bolt head. A Screw is a headed and threaded bolt used without a nut. It is inserted into an internally tapped hole and tension is induced by rotation of the screw head. A Stud is a fastener with no head but it has threads at both ends of the shank. It, like a screw, has one end that, screws into a tapped hole. A nut is used on the other end to create tension. If a stud is threaded its entire shank length and a nut used on both ends to create tension, it serves the function of a bolt and is then classified as a Stud Bolt. Many variations of these basic fastener types are available. The diameter of all bolts is measured as the outside of major diameter of the thread. The length of a headed boll is measured from the largest diameter of the bearing surface of the head to the extreme end of the point in a line parallel to the axis of the bolt. 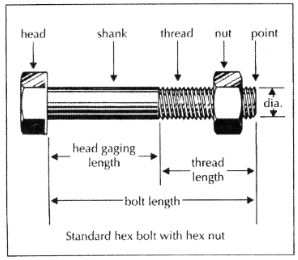 For example, square or hex head bolts are measured from under the head to the* end of the bolt; a bolt with a countersunk head is measured overall. The point of a bolt is always included in the measured length. Headless fasteners such as studs are measured overall, including points, except for continuous thread alloy studs made to ASTM Specification Al 93. This type is measured from first thread to first thread. Heat treatment covers various techniques that may be used to develop certain end-product characteristics. Customary procedures for fasteners include annealing, stress relieving, case hardening, direct quench and temper, and carbon restoration. A thermal cycle involving heating to, and holding at a suitable temperature and then cooling at a suitable rate, for such purposes as reducing hardness, improving machinability, facilitating cold working, producing a desired microstructure, or obtaining desired mechanical or other properties. A thermal cycle involving heating to a suitable temperature, usually 1000/1200°F, holding long enough to reduce residual stresses from either cold deformation or thermal treatment, and then cooling slowly enough to minimize the development of new residual stresses. tempering, or the selective hardening of the surface layer by means of flame or induction hardening. A thermal process used to increase the hardness and strength of steel. It consists of austenitizing, then cooling at a rate sufficient to achieve partial or complete transformation to martensite. Standard industrial fasteners are manufactured from either carbon or alloy steels. When strength requirements are moderate, low-carbon steel is used. High-strength fasteners are made from medium-high carbon or alloy steels and are heat treated to develop desired properties. Most fasteners are covered by specifications that define required mechanical properties such as tensile strength, yield strength, proof load, and hardness. The maximum tensile stress in pounds per sq. in, which a material is capable of sustaining, as developed by a tension test. The stress at which a material exhibits a specified deviation from the proportionality of stress to strain. The deviation is expressed in terms of strain, and in the offset method, usually a strain of 0.2 percent is specified. The point to which a material may be stressed without evidence of permanent deformation. The resistance of a material to plastic deformation. Usually measured in steels by the Brinell, Rockwell, hr Vickers indentation-hardness text methods. Screw threads are spiral grooves produced on the outside of a bolt (external threads) or machined inside a nut (internal threads). Four thread forms have been established by the ANSI: UN(internal and externaf threads). UNR (external threads only), UNK (external threads only), UNJ(internal and external threads). cial bolts or studs, not to the method of thread production. A cut-thread bolt has a shank diameter equal to the threaded diameter; a rolled-thread bolt has a shank diameter less than the threaded diameter. Classes of thread fit are distinguished from each other by the amounts of tolerance specified. Classes 1 A, 2A, and 3A apply to external threads; Classes 1B, 2B and 3B, to internal threads. Class 5 is a special interference fit which results in an actual overlap of dimensions when threaded parts are fitted together. It is normally used only on the tap-end of studs. aeronautical work. Threads per inch range from 28 threads for a 1/4-in.-diameter bolt to 12 threads for a 1-1/2-in.-diameter bolt. There is no fine-thread standard for fasteners over 1-1/2 in. The 8-thread series (8UNR or 8UN) is used only for sizes over 1 in. in diameter, usually in high-temperature, high pressure service.